Still playing catch-up. Rather than go night-by-night, here is a summary of September’s SALSA3 meteor detections. September is an interesting month in that it sees high meteor rates no single shower is very active. The Orionids are still a month away from their mid to late October peak. 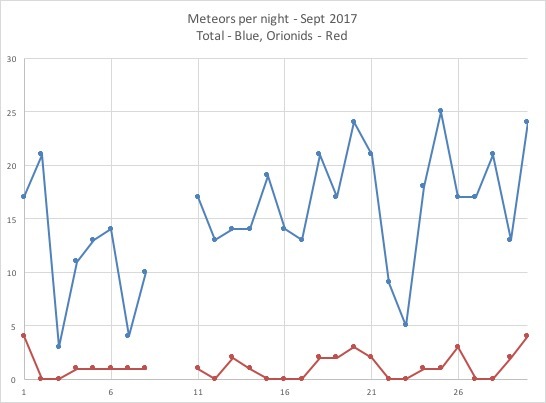 While they will be a major producer for a few days in October, during September they produced ~1 video meteor per night. The second best shower were the September Lyncids which were active for most of the last 2/3rds of September. The 12 video meteors corresponds to only ~0.5 meteors per night. A total of 429 meteors is low for my system during the month of September. Usually the number is closer to 550. In the next update (containing my early October results), I’ll explain some of the problems I’ve been running into with my camera system and how I’m (slowly) trying to address them.